In the latest installment of ‘The Insider’ series, meet Keisha Omilana, a fashion designer and model who is known as the ‘Pantene Girl,’ as she is the first African American woman to be featured in three consecutive commercials. Originally hailing from Inglewood, California, she earned her fashion degree in Chicago and soon began a successful career as a fashion model. Keisha has worked with major brands such as L’Oreal, Maybelline, Revlon and Cover Girl. In addition to her modeling career, Keisha is a wife, mother and businesswoman. She along with her husband own Wonderful Brand, a multifaceted business encompassing fashion, television and the Internet. 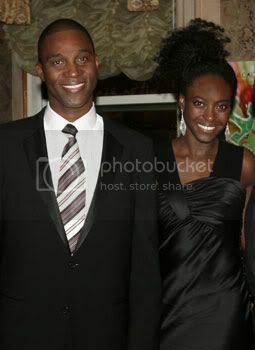 When I met my husband Kunle, I admired his pride in his heritage and his passion for giving back to those in need. Kunle is a Nigerian prince and owns Wonderful TV and Wonderful Airline. His accomplishments inspired me to want to give more, do more and become more. So together we brainstormed on how to incorporate my fashion and film background with his achievements in international multimedia. Hence, Wonderful Media and the Wonderful Award were created. In our first project we used our aircraft to deliver food and goods to the bush areas of Nigeria – some of the poorest and most needy areas of Nigeria where commercial aircraft never go. We are currently assisting clergy from all over Africa build their congregations. Additionally, we assist unknown but very talented designers from all over the world in getting much needed exposure. We help national media and entertainment companies expand their brands internationally through our network of international business leaders and through Wonderful TV. We are currently developing the Wonderful Award to launch in 2010. The Wonderful Award will honor corporations and corporate executives who give back to the black community. Many young girls today are growing up with negative influences, such as music videos and songs that demean them. As a successful model, what are your thoughts on how we can help young girls, particularly girls of color, grow up in today's society to have a positive image of themselves? I believe confidence starts at home and sometimes in the DNA. I know some may disagree with what I'm about to say but I'm going to say it any way! When I was a teen I LOVED rap and hip hop. My sister was into Mariah Carey and I was into Tupac. But listening to that music and running home to see the videos never made me feel the need to do, say, act, or be any of those girls. In fact, I always thought it was funny and very entertaining. But you see, I had a very involved mother and a very religious father (who, by the way, hated what I was listening to) so I knew who I was, I knew my worth, I was grounded and had a healthy dose of self esteem. What other charitable initiatives are you involved in? I have been working with my manager to determine which philanthropic organization to donate my time to. After much research I’ve decided on former President Bill Clinton's Global Initiative and Clinton Foundation. To date, no president has done more for AIDS and Africa. I have always participated in various fashion shows that raise funds for The Make a Wish Foundation and recently became a supporter of Evidence, A Dance Company. In the future, I plan to start my own foundation through our Wonderful Media brand. It will be focused on infant/toddler burn victims. It will focus on a holistic approach to dealing with accidental burns. This issue is very close to heart as my son suffered third degree burns when he was 18 months old. It is very important to understand that no matter how safe your house is, accidents can happen. One of the projects that Keisha supports as she mentioned above is Evidence, A Dance Company. Evidence will host their annual ‘On Our Toes’ benefit in the Hamptons, Saturday, August 22, 2009. Founded by Ronald K. Brown, Evidence, A Dance Company is rooted in African dance fusing Contemporary, Jazz and Ballet with the rhythms and sounds of the African Diaspora and Caribbean cultures. The late afternoon gala will take place at the Watermill residence of The Honorable Bernard Jackson & Joyce Mullins-Jackson from 4:00pm to 7:00pm. Former CBS’ “The Early Show” co-anchor & best-selling author Rene Syler will be the event’s emcee. For more information on Evidence, A Dance Company and the event visit http://www.evidencedance.com/. Visit Keisha's website at www.keishaomilana.com. From the moment I met Keisha on a model call she stood out from all the other models, and she continues to. The content of her heart, the design of her DNA and the sense of self worth she inherited from her parents make her an exquisite role model. It's Wonderful to hear she's found a Wonderful soul mate to partner with to do Wonderful things with their lives while shaping a Wonderful imprint on the world. Thank you so much for sharing this WONDERFUL woman's story with the world!Keisha is the truest meaning of the word STAR..shining brightly even when no one is watching.. Her smile,energy & beauty light up a room and her spirit & heart are unmatched..Continued blessings to her & her family.